DM-307 for Ableton is a collection of production-ready drum racks, loops, and one-shots in a variety of contemporary musical styles; including electronic, hip hop, industrial, ethnic, rock and cinematic. The packs contain content derived directly from Heavyocity's award-winning DM-307: Modern Groove Designer which was developed through experimental recording, sound design, and synthesis techniques, resulting in a highly-stylized collection of modular synth drums, live percussion, and processed classic analog drum machines. The DM-307A Hip Hop pack contains sample hip hop drum loops created by Heavyocity's award-winning team of sound designers and composers. The hip hop loops, originally presented as MULTIs and Groove Presets in DM-307, are now formatted for Ableton in both "full" and "stem" form for intuitive manipulation. This DM-307A software also includes one multi-layered hip hop drum kit and categorized one-shots. 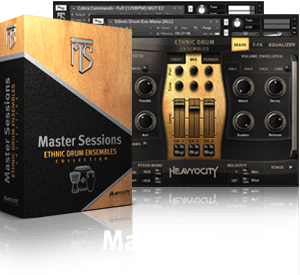 Master Sessions: Ethnic Drum Ensembles contains 6 unique ensembles comprised of Taikos, Daikos, Djembes, Brazil Drums, Frame Drums, and more. Quickly create grooves with the 490 presets and 375 tempo-synced loops organized into straight and triplet grooves.